Although I have seen this around relatively recently, it has been requested and it provides me with the opportunity to voice my opinion on the album and my somewhat controversial views about Def Squad. 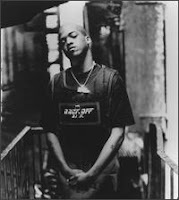 Originally paying his dues in kiddy rap outfit Illegal, Jamal is one of the few MCs of this ilk to have gone on to solo success. I think that ‘Last Chance, No Breaks’ is a solid effort, but there is something about it that means I rarely listen to it. Surprisingly, this is also the case for me with other albums from the Def Squad camp: more of that later. The most notable single on the album is of course ‘Fades Em All’ which is perhaps more widely known in its ‘Pete Rock Remix’ format (I’ve included this in the zip). Both of these selections are excellent, with a different feel to them that works well in both contexts. This is matched by Jamal’s verses that demonstrate an obvious maturity that was understandibly a little lacking in his Illegal days; the flow is more comfortable and accomplished. There are other choice cuts here as well. I like the laid back feeling of ‘Keep It Real’ with its smooth piano sample and I also like the darker ‘The Game’ that has a slow but seriously head noddy vibe. If you are into Def Squad then I imagine that you will appreciate the majorty of the production on this album as it is instantly recognisable as Erick Sermon or Redman’s work behind the boards. I’m sure that I’m going to get ripped to pieces for this… hit me up.